Sort this game out ASAP. 02/26/2019 11:05 AMPosted by Guldin02/26/2019 07:52 AMPosted by TyaniIs there even a way to defeat this opressive unfun deck?Yes. What you need to do is make a total of 17 big priest complaint threads on this forum within a 48 hour time period. Once you accomplish this feat, blizzard will email you a secret deck code that has a 100% win rate vs. Big priest.Or follow Guldin's example and play the deck, and pretend everything is fine and dandy and a turn 3 barnes into Y'shaarj into another Y'shaarj, Ragnaros or Ysera is peeeerfectly fine. 02/26/2019 09:54 AMPosted by Markmastershe says ''Arms?! Those aren't exciting enough''!Indicating he rather uses beasts for fighting over weapons (is what I think at least)Maybe, he means tentacles. He's a bit of a perv, that beastmaster. Shaman, where are thee, brotha! 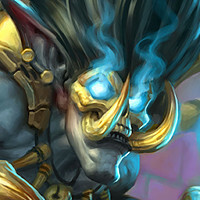 02/26/2019 05:01 AMPosted by SlimShadysure it was a cool card concept but in practice ,oh boy is it an abominationIt was such a cool concept that Ben Brode even tried to have it stopped due to it's sheer awesomeness. you either love or hate the guy, but atleast he was right in that it should have been changed before they shipped the expansion.While it's not a terror in Standard anymore, I feel for my wild brothers and sisters. 02/25/2019 05:45 PMPosted by AnimeFoodAs per the rules of the forums, do not ever call out specific people in Blizzard.And secondly, they already know whats going on. You don't need to tell them rez priest is a problem.Yes, I heard they're nerfing Fireball to be 5 mana next time!